This morning we set off 50km south-west of where we’re staying in Oiartzun in order to watch the LXXXVII edition of the Ordiziako Klasika. A 165,7km circuit on the UCI Europe Tour, around the town of Ordizia, which takes in 5 ascents of the Alto de Abaltzisketa and 2 of the Alto de Altzo. The participants included teams from Euskaltel-Euskadi, Footon-Servetto and Caisse d’Epargne and well-known riders such as Igor Anton, Benat Intxausti, Romain Sicard, David Arroyo, Francisco Mancebo and Ezequiel Mosquera. There was a huge, local, crowd to welcome the riders which swelled considerably as the race progressed. 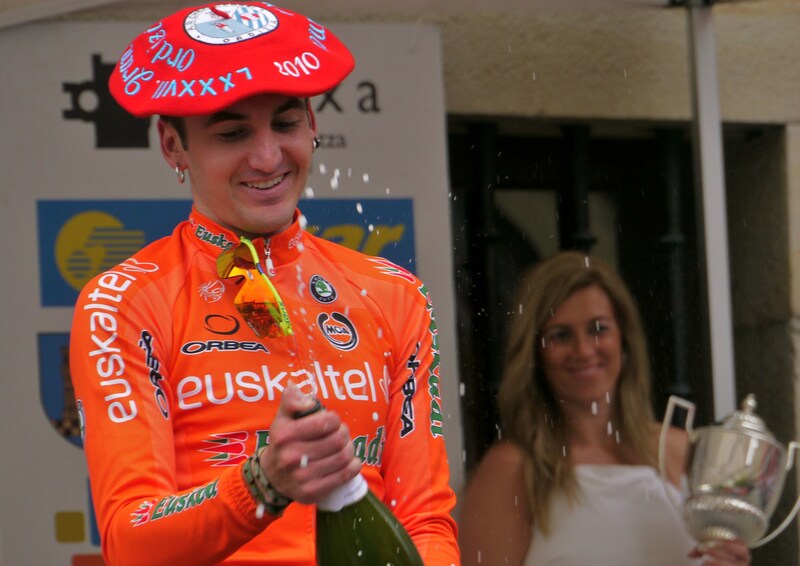 Most proclaimed their support for the Basque riders by either wearing the Basque flag or the orange of Euskaltel-Euskadi. The spectators watched the peloton pass before retreating once again to their local bars, of which there were aplenty. A 3-man break away was quickly established which was whittled down to just Romain Sicard and Egoitz Garcia (Caja Rural) but they never gained more than 3 minutes on the peloton which broke and then came back together again. The break away was finally absorbed but another Euskatel rider soloed to victory ahead of the mass sprint uphill to the line. To the delight of the spectators, the winner was local boy, neo-pro, Gorka Izaguirre (Euskaltel-Euskadi) who finished ahead of Manuel Ortega (Andalucia Cajasur) and Pablo Lastras (Caisse d’Epargne) to record his 2nd win of the season. His first was the last stage of the Tour of Luxembourg in June. Burgos 2016 – Castilla Leon won the team prize, Sicard carried off best U23, most aggressive, the mountain’s classification and the longest escape while Garcia won the points. The winner, Izaguirre, also won the prize for the ¨Most Elegant Rider¨ (I kid you not). I hope Euskaltel bought a large van to carry off all the swag: 6 trophies, 6 bouquets, 6 cheeses, 6 Cava, 1 red beret and 1 framed certificate. We then hopped in the car to head back to the hotel to watch the last stage of this year’s Tour de France. While I appreciate that it’s largely a procession, there was still the points (green) jersey to be decided. As I watched the peloton riding over the cobbles on the Champs Elysees heading, towards the l’Arc de Triomphe, I was reminded of my own recent ride in London-Paris. Those cobbles are painful; no wonder they try to ride in the gutter. To no one’s surprise, Cavendish won at a canter to make it 5 wins this Tour and 15 in total but Petacchi retained the green jersey and becomes one of only 4 men to have won the points jersey in all three Grand Tours. Radioshack had started the stage wearing unsanctioned special black Livestrong shirts but were obliged by the UCI to revert to their usual authorised grey kit: cue quick roadside kit change. However, as winners of the Best Team, they reprised the Livestrong shirts for the presentation. These shenanigans garnered plenty of column inches which I’m sure was the intent.